Csaba, Bugsy and Rosco want everyone to know that Inn on Mill Creek is a pet friendly B&B near Asheville. The Oak Leaf Room can accommodate both humans and their four-legged family members. In addition to welcoming your pet, we have the scoop on pet-friendly shops and restaurants, and great hikes for dogs and people. Even though as a general rule, the innpugs are…shall we say, lazy…they have hiked trails up to a couple of miles, and know all the hiking spots near the inn and on the Blue Ridge Parkway. We can also share information on the nearby area attractions that you can enjoy with your pet. So not only are the innpugs well-versed in the local nature trails, but they’ve also been to Chimney Rock State Park, the North Carolina Arboretum, Grandfather Mountain, Mt. Mitchell, and Biltmore Estate and can tell you all the cool outdoor places to sniff. Be sure to check out our pet guest photo album on Facebook! They are more popular than we are and are local mini-celebrities, so they get their own page! Bugsy, Csaba (pronounced “Chubba”) and Rosco are the resident innpugs at Inn on Mill Creek. Csaba is the social, huggable senior fawn pug with a rogue tongue that hangs out one side of his mouth. Bugsy is the shy-yet-charming elder black pug who thinks he’s a cat…we say he’s a diva with a “cat-itude”, but shhh, don’t tell him. Rosco is the younger black pug and he’s a big sweetheart who was rescued by Southeast Pug Rescue & Adoption (SEPRA) and adopted by us in 2013, when he was about five years old. During the day, the innpugs lounge in our part of the house catching up on beauty rest. They do love to greet dog-loving guests with a happy wiggle of their curly tails and trademark pug snort. They are not permitted to go in guests’ rooms or to roam around the Inn unattended; however, as well-behaved innpugs, they like to make the occasional appearance if the guests don’t mind, in order to make sure everyone is having a perfect day and a perfect stay. Being pugs, they’re watching their weight, so even though they’re masters of the “sad” face, please resist the urge to feed them. As even-tempered, low-key members of the Toy Breed group, the innpugs’ self-imposed responsibilities are simply to love and be loved. They are not excitable dogs nor are they aggressive. It’s hard to be that way when you’re only 16 inches tall and happy all the time. But…they are still dogs and will sometimes bark a hello. Or two. Or seven. As toy breed dogs, they do like to be the center of attention. And so they don’t bark at you. Rather, they announce their own presence when you say hi. Bugsy is master of the polite bark (inaudible from more than 10 feet away). Csaba lends a vocal hand while usually not having a clue why he’s barking, often facing the opposite direction, or will run past you barking and then will keep going like Forrest Gump on a football field…quite entertaining. Rosco is not much of a barker, but he is still very outgoing and loves greetings. 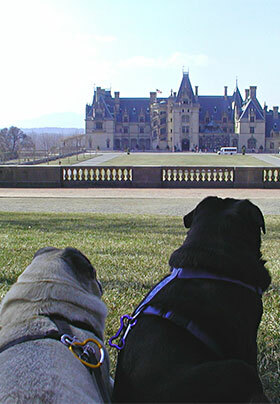 Brothers from the same litter, Csaba Pugga and Bugsy Pug were born in October of 2004, just two days after Dave and Brigette’s Asheville wedding. They had a blog when they were younger, but the B&B life is now their full-time gig, along with training little brother Rosco. 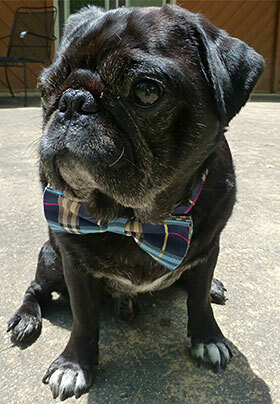 We unfortunately don’t know anything about Rosco’s first five years, but he sure does love being an innpug! Csaba Pugga is the epitome of contentment. He is 26 pounds of pure joy, and he loves that B&Bs are the perfect place to relax and take it easy. Csaba enjoys getting hugs, taking a nap on the office couch, giving “low” fives, taking a nap in his dog bed, and chasing ladybugs, wind-driven leaves and snowflakes before settling in for a long nap, all in that order. Bugsy Pug is our tiny silver-furred curmudgeon and his favorite past-times include watching Innkeeper Dave’s every move, laying in the sun, going for short strolls and showing off his orange stuffed animal kittycat. Rosco E. Walters has a big heart and adores people, so he is loving life at Inn on Mill Creek Bed & Breakfast. He is generally a laid back little dude, but can sometimes be very anxious around dogs other than his brothers. However, getting loved on by humans makes him extremely happy. He is mostly blind, but gets around OK and likes to follow his human, Innkeeper Brigette, everywhere.